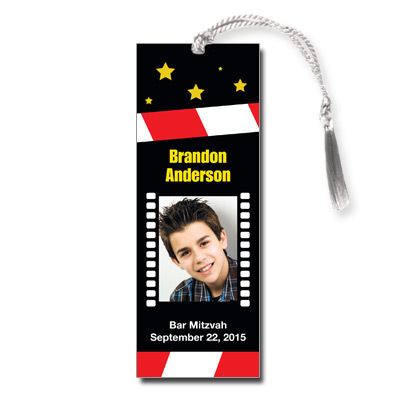 Remember your Bar Mitzvah with this movie theme bookmark. Your name and event date appear in the center around your favorite photo against a hollywood star background. Bookmark measures 2x5.5 and comes with white tassels; light assembly required. BarMitzvahCards.net is an Expressionables boutique shop specializing in helping you plan and create personalized Bar/Bat Mitzvah invitations, matching thank you notes, response cards, and bookmarks. *Free Shipping offer applies to orders shipped within the US only. Excludes wrapping paper. 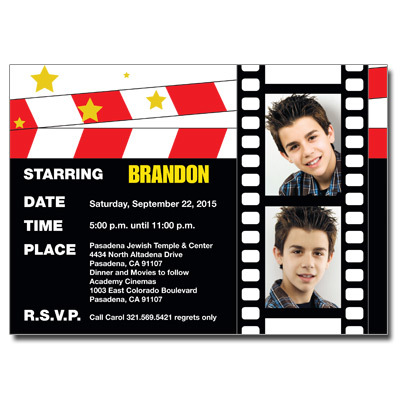 BarMitzvahCards.net specializes in personalized Bar Mitzvah invitations & Bat Mitzvah invitations. Create custom Bar Mitzvah photo invitations, party favors, save the date cards, thank you notes, custom gift wrapping paper, & more. Every Bat/Bar Mitzvah invitation card, keepsake, & favor is printed by the world class leader in personalization and variable data printing, DME. Our designs accommodate all themes and styles. Choose to customize modern Bar Mitzvah invitations or traditional ones, elegant cards or unique ones. Our signature line offers high end stationery at a stunningly cheap price. 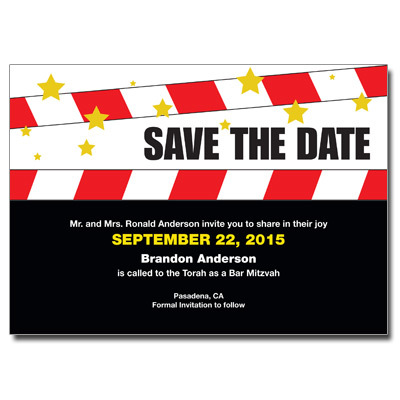 Our premium line offers elegant, handmade invitations & designer cards. Use our customer discount code to save on all orders. 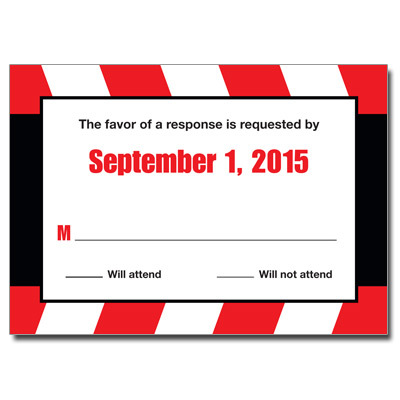 We also offer sample invitations for customers in the planning stage who are still looking for invitation ideas. At BarmitzvahCards.net, we have the perfect suite of Bar/Bat Mitzvah party supplies and invitation cards for you.